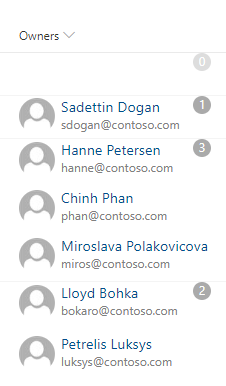 You can use column formatting to customize how fields in SharePoint lists and libraries are displayed. To do this, you construct a JSON object that describes the elements that are displayed when a field is included in a list view, and the styles to be applied to those elements. The column formatting does not change the data in the list item or file; it only changes how it’s displayed to users who browse the list. Anyone who can create and manage views in a list can use column formatting to configure how view fields are displayed. Samples demonstrated in this article and numerous other community samples are available from a GitHub repository dedicated for open-sourced column formatting definitions. You can find these samples from the sp-dev-column-formatting repository at SharePoint GitHub organization. How is column formatting different than the Field Customizer? Both column formatting and SharePoint Framework Field Customizer extensions enable you to customize how fields in SharePoint lists are displayed. The Field Customizer is more powerful because you can use it to write any code that you want to control how a field is displayed. Column formatting is more easily and broadly applied. However, it is less flexible, because it does not allow for custom code; it only allows for certain predefined elements and attributes. The following table compares column formatting and the Field Customizer. If you can accomplish your scenario by using column formatting, it’s typically quicker and easier to do that than to use a Field Customizer. Anyone who can create and manage views in a list can use column formatting to create and publish customizations. Use a Field Customizer for more advanced scenarios that column formatting does not support. To open the column formatting pane, open the drop-down menu under a column. Under Column Settings, choose Format this column. If no one has used column formatting on the column you selected, the pane will look like the following. A field with no formatting specified uses the default rendering. 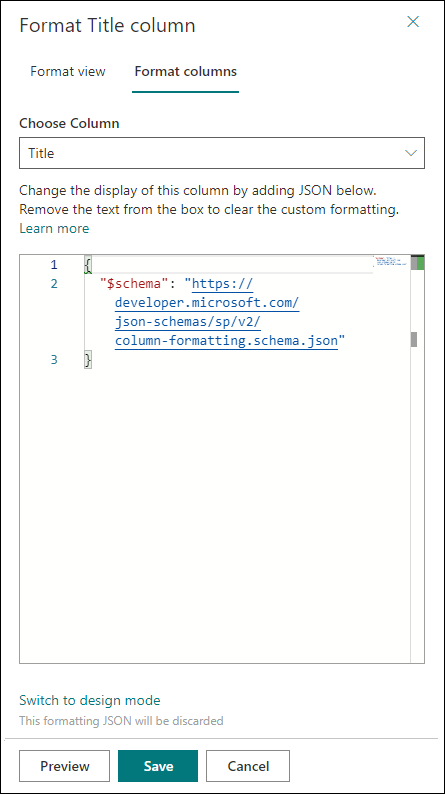 To format a column, enter the column formatting JSON in the box. To preview the formatting, select Preview. To commit your changes, select Save. When you save, anyone who views the list will see the customization that you applied. The easiest way to use column formatting is to start from an example and edit it to apply to your specific field. The following sections contain examples that you can copy, paste, and edit for your scenarios. There are also several samples available in the SharePoint/sp-dev-column-formatting repository. You can use column formatting to apply styles, classes, and icons to fields, depending on the value inside those fields. The following image shows an example of conditional formatting applied to a number range. This example uses an Excel-style conditional expression (=if) to apply a class (sp-field-severity--warning) to the parent <div /> element when the value in the current field is less than or equal to 70. This causes the field to be highlighted when the value is less than or equal to 70, and appear normally if it's greater than 70. "class": "=if(@currentField <= 70,'sp-field-severity--warning', '')"
"iconName": "=if(@currentField <= 70,'Error', '')"
You can apply conditional formatting to text or choice fields that might contain a fixed set of values. The following example applies different classes depending on whether the value of the field is Done, In Review, Has Issues, or another value. This example applies a CSS class (sp-field-severity--low, sp-field-severity--good, sp-field-severity--warning, sp-field-severity--severeWarning, sp-field-severity--blocked) to the <div /> based on the field's value. It then outputs a <span /> element with an IconName attribute. This attribute automatically applies another CSS class to that <span /> that shows an Office UI Fabric icon inside that element. Finally, another <span /> element is output that contains the value inside the field. This pattern is useful when you want different values to map to different levels of urgency or severity. You can start from this example and edit it to specify your own field values and the styles and icons that should map to those values. "class": "=if(@currentField == 'Done', 'sp-field-severity--good', if(@currentField == 'In progress', 'sp-field-severity--low', if(@currentField == 'In review', 'sp-field-severity--warning', if(@currentField == 'Has issues', 'sp-field-severity--severeWarning', 'sp-field-severity--blocked')))) + ' ms-fontColor-neutralSecondary'"
"iconName": "=if(@currentField == 'Done', 'CheckMark', if(@currentField == 'In progress', 'Forward', if(@currentField == 'In review', 'Error', if(@currentField == 'Has issues', 'Warning', 'ErrorBadge'))))"
Because dates are often used to track deadlines and key project timelines, a common scenario is to apply formatting based on the value in a date/time field. To apply formatting based on the value in a date/time field, apply the following patterns. This example colors the current field red when the value inside an item's DueDate is before the current date/time. Unlike some of the previous examples, this example applies formatting to one field by looking at the value inside another field. Note that DueDate is referenced using the [$FieldName] syntax. FieldName is assumed to be the internal name of the field. This example also takes advantage of a special value that can be used in date/time fields - @now, which resolves to the current date/time, evaluated when the user loads the list view. If you have spaces in the field name, those are defined as _x0020_. For example, a field named "Due Date" should be referenced as $Due_x0020_Date. "color": "=if([$DueDate] <= @now, '#ff0000', '')"
To compare the value of a date/time field against a date that's not @now, follow the pattern in the following example. The following example colors the current field red if the due date was <= tomorrow. This is accomplished using date math. You can add milliseconds to any date and the result will be a new date. For example, to add a day to a date, you'd add (24*60*60*1000 = 86,400,000). This example demonstrates an alternate syntax to express a conditional expression, using the ternary (?) operator inside an abstract syntax tree. "color": "=if([$DueDate] <= @now + 86400000, '#ff0000', '')"
To compare a date/time field value against another date constant, use the Date() method to convert a string to a date. The following example colors the current field red if the value in the DueDate field is before 3/22/2017. "color": "=if([$DueDate] <= Date('3/22/2017'), '#ff0000', '')"
You can use column formatting to provide hyperlinks that go to other webpages, or start custom functionality. This functionality is limited to static links that can be paramaterized with values from fields in the list. You can't use column formatting to output links to protocols other than http://, https://, or mailto:. This example shows how to turn a text field that contains stock ticker symbols into a hyperlink that targets the Yahoo Finance real-time quotes page for that stock ticker. The example uses a + operator that appends the current field value to the static hyperlink http://finance.yahoo.com/quote/. You can extend this pattern to any scenario in which you want users to view contextual information related to an item, or you want to start a business process on the current item, as long as the information or process can be accessed via a hyperlink parameterized with values from the list item. The following image shows action buttons added to a field. A <span /> element that contains the person’s display name. An <a /> element that opens a mailto: link that creates an email with a subject and body populated dynamically via item metadata. The <a /> element is styled using the ms-Icon, ms-Icon—Mail, and ms-QuickAction Fabric classes to make it look like a clickable email icon. Use column formatting to combine conditional and arithmetical operations to achieve basic data visualizations. The following image shows a number column formatted as a data bar. This example applies background-color and border-top styles to create a data bar visualization of @currentField, which is a number field. 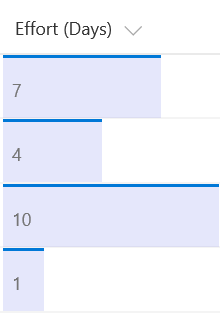 The bars are sized differently for different values based on the way the width attribute is set - it's set to 100% when the value is greater than 20, and (@currentField * 5)% otherwise. To fit this example to your number column, you can adjust the boundary condition (20) to match the maximum anticipated value inside the field, and change the equation to specify how much the bar should grow depending on the value inside the field. "width": "=if(@currentField >= 20, '100%', (@currentField * 5) + '%')"
This example relies on two number fields, Before and After, for which the values can be compared. 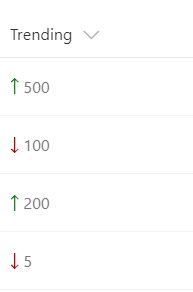 It shows the appropriate trending icon next to the After field, depending on that field's value compared to the value in Before. sp-field-trending--up is used when After's value is higher; sp-field-trending--down is used when After's value is lower. "iconName": "=if([$After] > [$Before], 'SortUp', "=if([$After] < [$Before], 'SortDown', ''))"
You can use column formatting to create buttons that, when selected, run Flows on the corresponding list item. If the Flow is configured to gather data from the end user before running, the Flow Launch Panel will be displayed after choosing the button. Otherwise, the Flow will just run. Choose Flow > See your flows in the SharePoint list where the Flow is configured. Choose the Flow you want to run. Copy the ID from the end of the URL. You can use column formatting to apply styles to each member of a multi-value field of type Person, Lookup and Choice. The following image shows an example of multi-value field formatting applied to a Person field. This example uses the length operator to detect the number of members of the field, and used join operator to concatenate the email addresses of all members. This example hides the button when no member is found, and takes care of plurals in the text. "display": "=if(length(@currentField) > 0, 'flex', 'none')"
"='all ' + length(@currentField) + ' members'"
The following image shows an example of constructing a simple sentence from the values of a multi-value Lookup field. This examples uses operator loopIndex and length to identify the last member of the field, and attribute forEach to duplicate HTML elements. 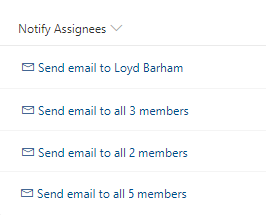 The following image shows an example of building a list of users with pictures, email addresses and a simple counter for the number of members at the top. This examples uses operator loopIndex to control the margins all rows but the first one, and attribute forEach to build the list of members. "background-color": "=if(length(@currentField) == 0, '#ddd', '#aaa'"
"margin-top": "=if(loopIndex('person') == 0, '0', '1em')"
You can use the following predefined classes for several common scenarios. sp-field-customFormatBackground Specifies the padding and margins for all classes that use backgrounds. The icons shown above for the sp-field-severity classes are NOT part of the class. Only the background color is included. Icons can be added by using the iconName attribute. In addition to the classes listed above, the classes (such as the theme color, typography, grid system, etc.) defined by the Office UI Fabric can be used. For details, see the Fabric website. 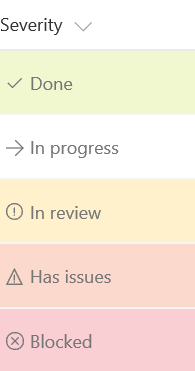 You can use predefined icons from Office UI Fabric. For details, see the Fabric website. Download Visual Studio Code. It's free and fast to download. In Visual Studio Code, create a new file, and save the empty file with a .json file extension. Paste the following lines of code into your empty file. You now have validation and autocomplete to create your JSON. You can start adding your JSON after the first line that defines the schema location. At any point, select Ctrl+Space to have Visual Studio Code offer suggestions for properties and values. For more information, see Editing JSON with Visual Studio Code. SharePoint Patterns and Practices provides a free web part, Column Formatter, that can be used to edit and apply formats directly in the browser. Any other value will result in an error. defaultClick: buttons with this action will do the same thing as clicking the list item in an uncustomized view. Below is an example of a button that, when clicked, simulates a click on the item, which results in the details pane being opened. share: Clicking the button will open the sharing dialog. Below is an example of this type of button. delete: Clicking the button will open the delete confirmation dialog. editProps: Clicking the button will open the item properties page in edit mode. executeFlow: Clicking the button will launch the specified Flow, specified by ID inside the actionParams attribute. For an example of this, see the Create a button to launch a Flow section in this document. An optional property that specifies the text content of the element specified by elmType. The value of this property can either be a string (including special strings) or an Expression object. An optional property that specifies style attributes to apply to the element specified by elmType. This is an object with name-value pairs that correspond to CSS names and values. The values of each property in the style object can either be a string (including special strings) or an Expression object. The following style attributes are allowed. The following example shows the value of a style object. In this example, two style properties (padding and background-color) will be applied. The padding value is a hard-coded string value. The background-color value is an Expression that is evaluated to either red (#ff0000) or green (#00ff00) depending on whether the value of the current field (specified by @currentField) is less than 40. For more information, see the Expression object section. "background-color": "=if(@currentField < 40, '#ff0000', '#00ff00')"
Any other attribute name will result in an error. Attribute values can either be Expression objects or strings. The following example adds two attributes (target and href) to the element specified by elmType. The target attribute is hard-coded to a string. The href attribute is an expression that will be evaluated at runtime to http://finance.yahoo.com/quote/ + the value of the current field (@currentField). An optional property that specifies child elements of the element specified by elmType. The value is specified as an array of elm objects. There can be an arbitrary level of nesting. If an element has the txtContent property, the child properties are ignored. An optional property that is meant for debugging. It outputs error messages and logs warnings to the console. An optional property that allows an element to duplicate itself for each member of a specific multi-value field. The value of "forEach" property should be in the format of either "iteratorName in @currentField" or "iteratatorName in [$FieldName]". iteratorName represents the name of iterator variable that is used to represent the current member of the multi-value field. The name of the iterator can be any combination of alphanumeric characters and underscore (_) that does not start with a digit. The field used in the loop must be in a supported field type with multi-value option enabled: Person, Lookup, and Choice. In the element with forEach or its childern elements, the iterator variable can be referred as if it is a new field. The index of the iterator can be accessed with loopIndex operator. forEach cannot be applied to the root element, and will render no element if there is no value in the field. Values for txtContent, style properties, and attribute properties can be expressed as expressions, so that they are evaluated at runtime based on the context of the current field (or row). Expression objects can be nested to contain other Expression objects. Expressions can be written using Excel-style expressions in SharePoint Online, or by using Abstract Syntax Tree expressions in SharePoint Online and SharePoint 2019. All Excel-style expressions begin with an equal (=) sign. This style of expression is only available in SharePoint Online (not SharePoint 2019). "txtContent": "=toString(45)" results in "45"
"txtContent":"=toLocaleString(@now)" results vary based on user's locale, but en-us looks like "2/5/2019, 1:22:24 PM"
"txtContent":"=toLocaleDateString(@now)" results vary based on user's locale, but en-us looks like "2/5/2019"
"txtContent":"=toLocaleTimeString(@now)" results vary based on user's locale, but en-us looks like "1:22:24 PM"
? : Conditional operations written in Abstract Tree Syntax use ? as the operator. This is to achieve an expression equivalent to a ? b : c, where if the expression a evaluates to true, then the result is b, else the result is c. For Excel style expressions you write these with an if statement. Regardless, there are 3 operands. The first is the condition to evaluate. The second is the result when the condition is true. The third is the result when the condition is false. "txtContent":"=if(4 < 5, 'yes', 'no')" results in "yes"
"txtContent":"=if(4 > 5, 'yes', 'no')" results in "no"
Multi-value field-related operators - The following operators are only used in a context with multi-value field of type Person, Lookup, or Choice. length, when provided with a field name, returns the number of members in a multi-valued field. When a single-value field is provided, length will return 1 when there is a value in that field. join concatenates values in a multi-value field with a specified separator. The first operand shall point to a value in a multi-value field, e.g. "@currentField.lookupValue", "[$AssignedTo.title]". The second operand shall be a string literal that is the separator that joins the values together. loopIndex, when provided with a name of iterator variable, returns the current index (starting from 0) of the iterator. The name of iterator must be provided as a string literal. loopIndex would only work within the element with respective forEach enabled or its children elements. Specifies the parameters, or operands for an expression. This is an array of Expression objects or base values. The values for txtContent, styles, and attributes can be either strings or Expression objects. A few special string patterns for retrieving values from the fields in the list and the user's context are supported. Will evaluate to the value of the current field. Some field types are represented as objects. To output a value from an object, refer to a particular property inside that object. For example, if the current field is a person/group field, specify @currentField.title to retrieve the person's name, which is normally displayed in list views. The following are the field types that are represented as objects with a list their properties. The @currentField.title returns a person's name by default. However, if the person field's Show Field has been adjusted, it may change the value of the title property. For example, a person field with the Show Field configured as Department will have the person's department for the title property. toLocaleString() - Displays a date type fully expanded with date and time. toLocaleDateString() - Displays a date type with just the date. toLocaleTimeString() - Displays a date type with just the time. For example, the following JSON will display the current field (assuming it's a date field) as a date and time string. The following example shows how a lookup field might be used on a current field. To reference the URL value, use @currentField. The following example shows how a hyperlink field might be used on a current field. The column is formatted within the context of the entire row. You can use this context to reference the values of other fields within the same row by specifying the internal name of the field surrounded by square brackets and preceeded by a dollar sign: [$InternalName]. For example, to get the value of a field with an internal name of "MarchSales", use [$MarchSales]. If the value of a field is an object, the object's properties can be accessed. For example, to access the "Title" property of a person field named "SalesLead", use "[$SalesLead.title]". This will evaluate to the absolute url for the site. This is equivalent to the webAbsoluteUrl value within the page context. This value is only available in SharePoint Online. This will evaluate to the email address of the current logged in user. "color": "=if(@me == @currentField.email, 'red', 'blue')"
This will evaluate to the current date and time. This will evaluate to the rendered index of a row within a view. This value is based on render position and will remain consistent based on position even as views are sorted and filtered. 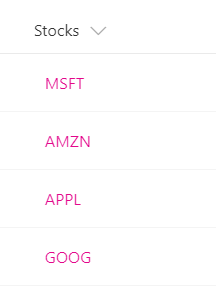 Indexes start at 0. This value is only available in SharePoint Online. "additionalRowClass": "=if(@rowIndex % 2 == 0,'ms-bgColor-themeLighter ms-bgColor-themeLight--hover','')"
This will evaluate to a number equal to the height of the browser window (in pixels) when the list was rendered. This will evaluate to a number equal to the width of the browser window (in pixels) when the list was rendered. @thumbnail.small, @thumbnail.medium, and @thumbnail.large evaluate to the thumbnail URL in 3 different predefined sizes. @thumbnail.<bounding size> evaluates to the URL to the largest thumbnails that is not larger than the bounding size in both width and height. For example, @thumbnail.150 evaluates to the URL to a thumbnail not larger than 150×150 pixels. @thumbnail.<bounding width>x<bounding height> evaluates to the URL to the largest thumbnail that is not larger than the bounding width and bounding height. For example, @thumbnail.100x200 evaluates to the URL to a thumbnail not wider than 100 pixels and not higher than 200 pixels. These tokens will yield no value on non-file items including folders. The aspect ratio of thumbnail generated is the same as how the file looks like, changing the bounding sizes will not affect the aspect ratio of the thumbnail. Thumbnails are only available for a list of supported file formats. It means that sometimes the URL generated is not accessible due to lack of support on certain formats. However, if a valid thumbnail token is set as the only src attribute of an img tag, we will take care of it and hide the image when it is not available. "alt": "='Thumbnail of file ' + [$FileLeafRef]"